Ah, Sinclair Lewis, the only person to date to have declined the much wanted Pulitzer Prize. Although he declined, the Pulitzer Board still lists him as the 1926 winner, so of course I read it anyway. I was looking forward to finally read something by Lewis after seeing his name appear so many times in the Jury’s decision notes. A Brief Summary*: Arrowsmith tells the story of bright and scientifically minded Martin Arrowsmith as he makes his way from a small town in the Midwest to the upper echelons of the scientific community. Along the way he experiences medical school, private practice as the only doctor in a small town, various stints as regional health official, and the lure of high-paying hospital jobs. The book contains considerable social commentary on the state and prospects of medicine in the United States in the 1920s. Dr. Arrowsmith is a progressive, even something of a rebel, and often challenges the existing state of things when he finds it wanting. Setting: The book starts in Lewis’ fictional county of Winnemac, but Arrowsmith moves all over from North Dakota, New York, and even goes for a brief stint in the West Indies. Time Period: 1900s – 1920s, with the bulk of the story set in the Prohibition era! My Thoughts: This book is a little hard to describe, but I would put it some sort of science/social commentary category. It’s the first medical book I’ve read, and it was able to make bacteria and test tubes all seem rather interesting and not too dry. We follow Martin Arrowsmith from his early childhood through mid-life as an idealistic truth-seeker who wrestles with the ideas that were hotly debated by the medical community in the 1920s. There’s the truth-seeking academic side who cares about only the science which is always being rushed or “exploited” by the profit-seeking pharmaceutical companies and research think tanks. (I put “exploited” in quotations because I will leave it up to you to decide which side’s arguments have more merits.) One thing I found striking is that despite being written almost a century ago, a lot of these topics are still relevant in the 21st century as we see moral debates over things like the business practices of Valeant Pharmaceuticals. Arrowsmith experiences much of the debate first hand, and his career path meanders through both sides of the debate so that we get a pretty well-rounded picture of the medical industry. I may be alone in this view, but I found the medical commentary much more interesting than the social aspects of the book. For one, I found most of the women characters written to be one-dimensional caricatures of wives, girlfriends, and nurses. Dear sweet Leora Arrowsmith is loyal, loving, and eager to learn from her husband – I have seen such a trend in these early Pulitzers of men looking to “educate” their naive, unsophisticated wives. She goes from living under her father and brother’s rules to living under Martin’s rules. She is the most likable character in the entire book, and I wish she had more of a presence beyond caretaker or jealous wife. The book is also a little repetitive at times – the same medical debates are being argued on different platforms again and again, but overall the writing is so smart and witty that I can forgive the repetition. “I wish people wouldn’t keep showing me how much I don’t know!” said Martin. Ultimately, I wanted Martin to grow and learn from his mistakes, but instead he packs up and moves to a new job in a new state every time he becomes disillusioned. He grows frustrated when he is unable to find a like-minded community and has to move every time his arguments make him unpopular with employers or colleagues, and yet he is always so sure that the problem is with everyone else and not himself. 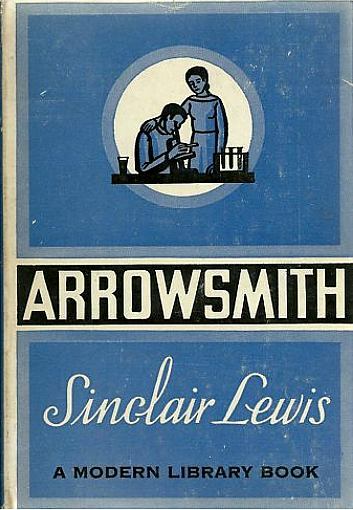 While I think the characters were a little under-developed and problematic, the ultimate focus of the book is the scientific community, and I was impressed with how well Sinclair Lewis was able to reconstruct this. I’m curious to see how people in the medical profession today would receive this book, so if you’re a doctor, pharmacist or nurse, please let me know your thoughts! I would recommend this book to people who are interested in science and social criticism, people who like books set in the roaring 20’s, and people who have and don’t mind listening to that one idealistic friend talk for way too long over a few beers. The summary is provided by Wikipedia. Up next is Early Autumn: The Story of a Lady, by Louis Bromfeld. I must admit I’ve already finished reading this, but just haven’t had a chance to write about it yet! Read along with me by sending me links to your reviews in the comments below, or follow along with our Pulitzer-Project tag. Intriguing, I will look out for this one, it certainly sounds different, the science aspects sound like they have been written right for the lay person and that is great, everything is interesting if it is communicated in the right way. I don’t read a lot of science or science-fiction books, so it was definitely very different from the other books I’ve read before. I agree though, anything can be interesting if it is communicated in the right way! Do you read a lot of science? I don’t read as much as I should, I do like space and natural sciences, a lot of stuff I pick up comes from the ‘popular science’ section whatever that means but Fermat’s Last Theorem and Guns, Germs and Steel and The Fabric of the Cosmos are too interesting books to check out. I need to get on with a Darwin book or two as well!